Making a list of interview questions, knowing which are the right questions to ask and which questions not to ask in your job interview, can be tricky. When you are asked, towards the end of the interview, "Do you have any questions?' it is important to have some insightful questions ready to ask. It is also important to know which questions are not appropriate and to avoid these in your interview. Asking the wrong questions can undo all the hard work you have put in during the job interview. Ask the right questions and make the right impression in your interview. 1. How many vacation days do I get? 2. How long is the lunch break? 3. What type of health insurance do you offer? Questions about company benefits give the impression that the candidate is more interested in what the company can provide rather than the job. Interviewers seek candidates who view things in terms of what the successful candidate can contribute to the organization. 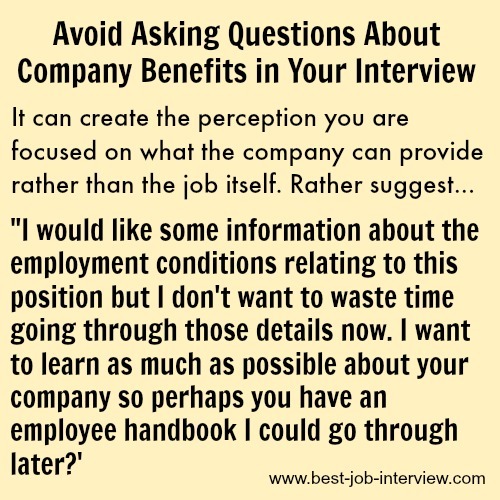 Company benefits are important but the initial job interview is not the time to focus on them. You can find out more about company benefits by asking the interviewer: "Where can I get details about the employment conditions relating to this position. Perhaps you have an employee handbook I could go through later? I don't want to waste time now going through the small print"
This indicates to the interviewer that this sort of information is of secondary importance to the job itself and your focus is on the position and the company while the other details can be looked at later. 4. Can I work from home? 5. Are the working hours flexible? Questions about the working schedule indicate that you may have a problem with a regular working schedule. These questions will raise doubts about your capacity and motivation to commit to the required working hours and working conditions. These are the sort of issues that should only be raised once you have been employed for a period of time. 6. How much overtime will I be expected to work? 7. Will I have to work on weekends? Interview questions about overtime raise red flags because they imply that you are reluctant to put in the extra hours or are unavailable to meet certain job requirements. Questions about extra hours will raise concerns that you are not willing to go the extra mile or be a motivated team member. If you need this information to make an employment decision rather ask "What is the typical working day (or week) like?" 8. What is the salary package for this position? Salary is a tricky issue. Some employers expect the candidates to bring it up but others regard it as inappropriate at this point in the interview process. The general rule is that it is best to wait until you are further along in the job offer process before you bring up the subject of pay. Of course, the interviewers themselves may ask questions about pay. You can use these sample answers to difficult interview questions about salary requirements to help you manage the pay question in your job interview. 9. What background checks do you perform on candidates? This interview question will alert the interviewer to a possible problem with your suitability. 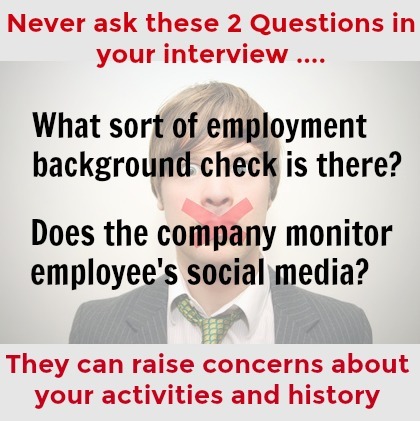 Even if there is nothing to be concerned about it will make the employer think that there is an issue that necessitates an employment background check. 10. What exactly does your company do? You should have done your homework before the interview and have this information already. Questions like this show that you have not prepared properly for your job interview. 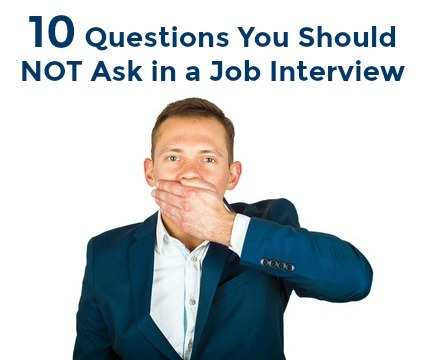 What interview questions are employers not allowed to ask? Of course there are a number of questions that employers cannot ask in an interview that are considered either illegal or inappropriate. You can find a comprehensive list of illegal interview questions here, together with excellent advice on how to respond to this type of interview question. Avoid asking questions about only one topic. The list of interview questions that you prepare should cover a variety of topics or you run the risk of appearing to lack the ability to see the position in its entire context. Include good interview questions to ask about the specific position. Develop a list of interview questions to ask the interviewer about the company and organization. 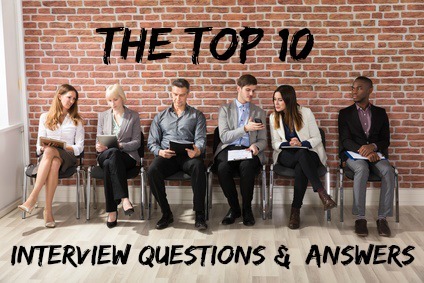 Prepare about ten questions to ask in the job interview in advance. Some of your potential questions may be answered during the course of the interview, and others may become irrelevant once you gain more information. Discard these questions or you will give the impression that you have not been listening or have not understood what has been discussed during the interview. A thoughtful list of interview questions will distinguish you from other job candidates, but as important as it is to ask the right question, avoiding bad questions is even more so. You can completely unravel the positive impression you have made during your job interview. Job interview answers to tough interview questions. How to answer tricky interview questions. Be aware of your interview body language when asking your list of interview questions. Send the message that you are confident and comfortable with asking your questions.